A total of 126 players showed up for the first day of event no. 21, the $10,000 seven-card stud World Championship, and after eight levels of action 91 still remain. The winner of the event will take home $331,639 in prize money, as part of the seven-figure prize pool that was generated. Action will resume on Monday at 3 p.m. local time. NOTE: The final four players took a one hour dinner break at the conclusion of Level 22 and will return shortly after 8:30pm to resume play. Alexander Kostritsyn started the level as the short stack and was all in with a pair of kings against Maxwell Troy’s pair of queens with just two cards to go. Kostritsyn failed to improve by seventh street while Troy hit the Q on the river to make trips, eliminating Alexander Kostritsyn in 5th place ($72,627). NOTE: Play resumed today at 3:00pm with 14 players, and with the elimination of Nick Schulman in 9th place ($32,488), the official eight-handed final table is now underway. Note: Three blind levels will be played each hour, as each is just 20 minutes long. Starting Stacks: 75,000 broken up into three chances — meaning that the players started with 25,000 and had 50,000 additional on the side that they could add on at anytime before a hand. If their additional chips were not in play when a hand begins, those chips couldn’t be used to wager with. Note: WSOP tournament staff said the event has been capped at 128 and that no one was locked out. After a four-bet preflop by Negreanu, Alex Kostritsyn made the call. The flop came K J 9 , and it was checked to Negreanu. He fired 3,600, and Kostritsyn called again. The 4 fell on the turn, and action was the same, but with Negreanu’s 9,200 getting called. The river brought the 10 and action went check-check. Negreanu tabled the top set of kings, and was disgusted by the horrendous river card for his hand. However, three kings were good, and Negreanu raked in the nearly 40,000-chip pot. In the levels following the pot, Negreanu was bleeding chips, eventually getting all in with the A 3 against the pocket kings of his opponent. Negreanu failed to improved and he was gone. Bloom won the hand and Kostritsyn hit the rail, leaving 15 players still contending in the tournament. Kostritsyn doubled up to 82,000 on the hand and Ivey fell slightly to 400,000. Seri was only all-in for 5,000 so Kostritsyn was only setback to 65,000. Former Aussie Millions champion Alexander Kostritsyn was recently eliminated from play during the late stages of the night. He decided to move all in with J-9 in the hole after a 9-3-3 flop hit the table but Erik Seidel was waiting for him with K-3 in the hole. The turn and river changed nothing and the tournament has arrived at the final 10. At the very end of the last level and right before the break, Adam Levy played a monster pot. Adam Levy and Fabien Dunlop got in five bets prefop and saw a flop of 10 9 2 and Dunlop checked over to Levy, who bet 80,000. Dunlop shoved all-in and Levy snap-called. Dunlop showed A 2 and Levy tabled A A . The turn was the 6 and the river was the 3 , which puts Levy at the top of the chip counts with 820,000. It looks like the Kenney brothers won’t be able to mirror the Mizrachi brothers and get to the final table as Tyler Kenney has been eliminated. Before the break he got a bunch of chips in with pocket queens and lost to the pocket eights of his opponent and was unable to have his hand hold. That hand left him with just 40,000 in chips and after the break, Kenney found all of his chips in the middle with A 9 against the A K of Tom Kallaway. The board bricked off for Kenney and he was eliminated from the tournament. A player in seat 1 moved all in for 68,300 and Hoyt Corkins eventually threw in a call with the ESPN cameras watching. It was the worst-case scenario for Corkins as his A J was dominated by seat 1’s A K .
But the flop turned the tables as it fell J 9 5 to give Corkins the lead. The A on the turn gave him two pair and the 2 on the river cemented the hand for Corkins. He scored the knockout and he was at 533,000. The player in the small blind moved all in for 46,700 after Shannon Shorr had put in a raise preflop. Shorr took a long session in the tank contemplating what to do. “Just go away,” the small blind said. Shorr gave a grin but then flung his pocket eights into the muck. He was rewarded by the small blind as he tabled A A . Shorr was down to 290,000. We picked up the action after the board had run out Q 4 2 9 Q . Alexander Kostritsyn fired 6,500 into a pot holding about 30,000 and his opponent mulled over the call. He eventually threw it in and Kostritsyn tabled the lowly 3 2 for queens and deuces. It was more than enough, however, as his opponent mucked. Kostritsyn raked in a nice pot and he was up to 590,000. David Sands raised preflop and Filippo Candio repopped to 17,400. Sands then shoved for 70,000 and Candio made the call. Sands was the victim of a cooler and the board ran out 10 10 4 6 5 , holding the aces and sending Sands to the rail. After the flop came down J 7 6 , Phil Galfond bet 23,000 and his opponent made the call. The turn was the 8 and both players checked. The river brought the 10 , putting out four cards to a straight. The other player fired 76,000 and Galfond responded by moving all in. His opponent called off his last 220,000 and Galfond tabled J 9 for the jack-high straight. His opponent showed his counterfeited straight, 5 4 , and he made his way to the rail as Galfond took in a huge pot. He was up to 545,000. Will Failla and his opponent got in 31,000 in the middle preflop and saw a flop of Q 7 2 . Failla checked over to his opponent, who bet 35,000. Failla thought for a few seconds before going all-in for 150,000 more. “I’ve been full of it before,” said Failla. His opponent eventually folded and showed the Q as he let his hand go. Failla offered to show his hand for $20. His opponent immediately reached into his pocket for 20 bucks, handed it over, and was promptly shown K K .
Erica Schoenberg got all in from the big blind against the player on the button. The button showed A 2 and Schoenberg showed A J . Thee board ran out 10 9 8 2 Q and Schoenberg doubled up to 85,000, giving her a tiny bit of breathing room. Dan Lu raised to 30,000 from the cutoff and Brett Richey three-bet to 90,000 from the button. After the blinds folded, Lu moved all-in and Richey made the call with his last 340,000 and showed 5 5 . He was going to need some help from the dealer when he saw Lu’s 10 10 . Richey was stood up to leave the table after the turn as the board ran out Q J 6 10 3 . Lu is over the million mark with the pot. Jan Boye moved all-in for 59,000 from the hijack and Christopher Bolt made the call from the big blind. Boye showed A K and was ahead of Bolt’s Q 9 . Bolt failed to improve and Boye doubled up to a still short 142,000. Theo Jorgensen raised to 38,000 from the cutoff and Dorothy VonSachsen moved all-in for 75,000 from the button. Jorgensen made the call and the cards were turned on their backs. Jorgensen showed A 6 and was up against the K 10 of VonSachsen. The board ran out A K J 9 4 and one of the last women standing was sent to the rail. Jorgensen is at 3,200,000 in chips and looks to be the chip leader at the moment. Four players saw a flop of Q 6 2 . James Fennell checked from the big blind, another player checked, and Steve Billirakis bet 58,000. Garrett Adelstein called and Fennell made it 175,000. The other player got out of the way and only Billirakis called the check-raise. The turn was the 5 and Fennell bet 230,000. Billirakis then moved all-in for 734,000 and was called by Fennell. It was an unfortunate turn card for Billirakis who turned two pair with his 5 6 and was still behind the set of Fennell who tabled 2 2 . The river was the 8 and Billirakis was sent to the rail. On the other hand, Fennell is just under 2,000,000 in chips. On the river, John Racner fired out 365,000 into a pot that already had about 500,000 in the middle with the board reading J 8 Q K J .
Jeff Banghart called the bet, but couldn’t rake the pot as Racener showed A 10 , giving him broadway. Racener is now at 2,150,000 and Banghart dropped to 330,000. Dash Dudley was all-in for K J for 183,000 and Sergey Serafimov called from the small blind with A K .
Dudley was in bad shape as the board came out 9 5 4 8 3 and Dudley was eliminated from this year’s main event. Jordan Siegel got his last 322,000 into the middle preflop and got a call from Alexander Kostritsyn. Kostritsyn held pocket tens, but was behind Siegel’s pocket aces. The flop came 7 10 A , leaving Kostritsyn drawing to just the case ten for the win. The turn was the 7 and the river was the 3 , which couldn’t give Kostritsyn quads for a sick beat. Two players at the table claimed they had folded aces after the hands were turned up, so they are either playing with an illegal deck of cards, or the players’ memory are slipping a bit. Steven Padres moved all-in preflop and was called by Jean-Robert Bellande. Bellande was in a commanding position with his K K against Padre’s Q Q . The board ran out A 9 2 7 K to give Bellande the pot and if Bellande keeps running like this, maybe he wont be “BrokelivingJRB” on twitter anymore. He is now up to 1,260,000. On a flop of 9 8 8 , Robert Mizrachi moved all-in for his last 132,000 and was called by Vern Keller. Mizrachi showed K K and Keller tabled 9 5 . The board finished off Q J and Mizrachi doubled up to 370,000. The Mizrachi count is at two with both him and his brother Michael in the tournament. Note: Players have gone on an unscheduled 20-minute break to color up the T1,000 chips. Picking up the action on a flop of J 10 7 , Daniel Chamberlain made a bet and Brandon Steven check-raised. Chamberlain moved in and Steven made the call. Chamberlain held the aces but needed to fade the spade draw. The turn was harmless with the 10 but the river was the 9 and Chamberlain was flushed away. Duy Le raised to 90,000 and Peter Jetten made the call. Both players saw the flop come down K Q 2 and Le bet 150,000. Jetten made the call and the turn was the 6 . Both players checked and the river was the K . Jetten bet 240,000 this time and Le mucked. Jetten was at 1.91 million. Tony Dunst raised preflop from under the gun and Edward Ochana made the call in the small blind. The flop came down 7 3 2 and Dunst bet 100,000. Ochana then moved in and Dunst called, putting himself at risk. Ochana flopped top pair but Dunst was ahead with the overpair. The board finished off A and 4 and Dunst doubled to 1.4 million. Picking up the action on the turn, the board read 10 10 8 4 and Theo Jorgensen fired 100,000. His opponent made the call and the river was the 7 . Jorgensen fired 300,000 and was called again. Jorgensen then showed A 5 for the nut-flush and his oppoonent mucked. Jorgensen was up to 4.8 million after the hand. Getty Mattingsley was all in for 761,000 preflop and Alexander Kostritsyn made the call. Here were the hands. It was a race and Kostritsyn jumped ahead on the Q 8 8 flop. The turn was the 8 , giving each player a full house with Kostritsyn’s still being best. The river was the 3 and Mattignsley was out. Kostritsyn was at 6.1 million after the hand. Ronnie Bardah raised to 80,000 and Gabriel Alarie made it 280,000 to go from the small blind. The big blind mucked and the action was back on Bardah. He shoved for 1.12 million and Alarie took a session in the tank. He decided to release his hand and Bardah took a nice pot without the bother of a flop. He was up to 1.5 million. Eric Baldwin raised to 76,000 preflop and David Baker moved all in from the small blind for 581,000. Baldwin made the call and the hands were turned over. The race was on and each player got a piece of the Q J 9 flop. Baldwin hit top pair and Baker nailed a set of jacks. The turn was the 8 and the river was the 3 and Baker doubled up to 1.2 million. Baldwin was down to 340,000. A few hands later, Baldwin moved in for 340,000 and Andrew Brokos made the call. Brokos turned over A 4 while Baldwin tabled K J . Baldwin hit a king on the turn and it held up as he doubled to 750,000. Brokos was down to 2 million. Robert Mizrachi moved all in for 239,000 from the big blind and he was called by Robert Pisando from the small blind. Here were their cards. Mizrachi was dominating and the flop left him freerolling when it fell K J 10 , giving Mizrachi Broadway. Pisano could only tie but the board finished off K and 3 and Mizrachi doubled to about 500,000. Pisano was at 4.05 million. Daniel Chamberlain raised to 44,000 from the cutoff and Gabriel Nassif moved in for 456,000 from the button. Chamberlain looked him up and the cards were turned over. Chamberlain was dominated and needed some help with a nine or some spades. The flop board ran out with all black cards, but they were the wrong suit for Chamberlain as it ran Q 10 4 4 K . Nassif scored the double up and he was up to 969,000. Picking up the action after the board had run out 7 5 2 K J , Alexander Kostritsyn fired 325,000 into a pot of about 470,000. 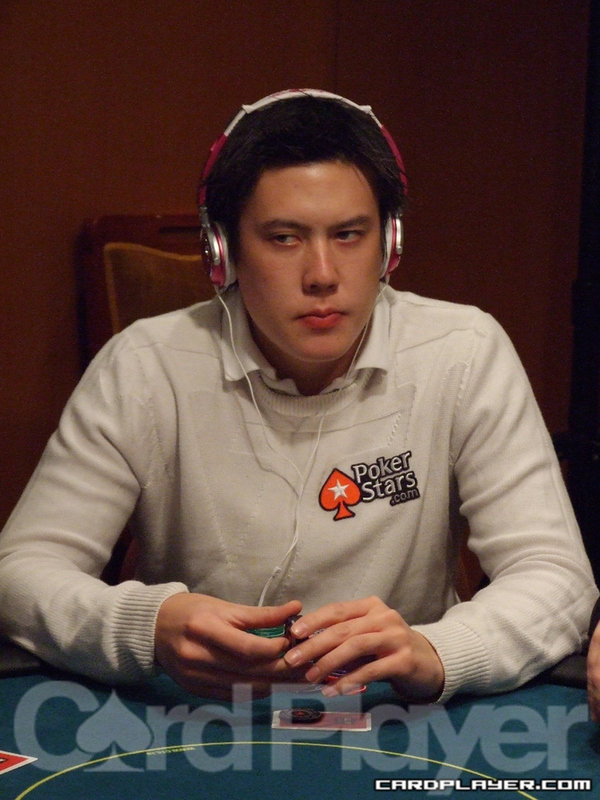 Mozheng Guan made the call and turned over 7 6 for top pair on the flop. It was good as Kostritsyn mucked and Guan took the pot. Guan was up to 1.4 million while Kostritsyn slipped to 2.4 million. Tony Bracy moved all in for 97,000 preflop and Redmond Lee decided to raise to 200,000. The isolation play worked as everyone else mucked and the hands were turned over. Lee was dominating and the flop fell Q J 8 , giving Lee a set. Bracy needed some runners to a flush or quads but the K on the turn left him drawing dead. The river was the 4 and Lee scored the knockout. He was up to 1.33 million. Johnny Lodden raised to 50,000 from late position and Denis Pisarev made the call from the button. The flop fell A 10 2 and Lodden checked. Pisarev fired 65,000 and Lodden made the call. The turn was the 2 and both players checked. The river was the 7 and Lodden led out with 205,000. Pisarev made a quick call but Lodden turned over A 7 for two pair and Pisarev mucked. Lodden took down a nice pot and he was at 2 million in chips. Matt Affleck raised to 48,000 from the cutoff and Christian Harder made the call from the button next door. The two saw a flop of 9 8 5 and Affleck led for 65,000. Harder made the call and the turn was the A . Affleck fired another 115,000 into the pot and it was enough to take it down as Harder mucked. Affleck took the pot and he was at 3.1 million. Harder slipped to 1.11 million. Singer had two live cards but they were as good as dead when the flop fell A A 4 . Singer needed running cards but his running shoes were shot off his feet when the A on the turn gave Gibb quads and left Singer drawing dead. The meaningless river was the 4 and Singer was eliminated. Diogo Borges was all in for 520,000 preflop against Theo Jorgensen preflop. Here were their cards. Borges was dominated and the board ran out A K 7 QQ 10 , giving both players two pair but Jorgensen the better end of it. Borges was out and Jorgensen was at 3.8 million. Picking up the action on the flop, the board read Q 10 5 and there was about 500,000 already in the pot. Paulo Figueiredo moved all in for 498,000 and Bryn Kenney made the call to put him at risk. Kenney flopped top pair but was up against the pocket aces of his opponent. But the turn was the Q , giving Kenney trips and leaving Figueiredo one step closer to the door. The river was the 7 and Kenney scored the improbable knockout. He was up to 3.38 million. Francois Binette and Michal Wywrot each put in three-bets before they saw a J 10 2 flop. Wywrot fired 162,000 and Binette shoved for 750,000. Wywrot made the call and he turned over A A . Binette was drawing to a straight with K Q . But the turn was the Q and the river was the J , giving Binette little help and he was out. Wywrot was up to 1.7 million. Jonathan Driscoll raised it up to 44,000 from the hijack and Theo Tran made the call from the big blind. He then turned over his A-5, thinking he was all in. The floor was called and Tran’s hand was ruled live. The flop then came down A 5 4 and Driscoll mucked immediately. Tran took the pot and was at 170,000. However, since Tran exposed his hand, he was given a one-round penalty. Jordan Siegel moved all in for 268,000 and he was looked up by Jared Ingles in the hijack. Siegel turned over A 9 but was trailing Ingles’ Q Q . The board ran out K 5 3 10 3 and Siegel was eliminated. Evan Lamprea raised from the cutoff and David Benyamine put in another raise from the button. Lamprea moved enough chips into the middle to put Benyamine all in and he made the call. Benyamine was dominating and the flop fell Q 9 4 , giving Benyamine four to a flush. It also took away a few of Lamprea’s outs and he was left drawing dead when the 9 came on the turn. The river was the Q and Benyamine doubled to 800,000 while Lamprea slipped to 2.58 million. Gualter Salles raised to 50,000 preflop and Adam Levy made it 142,000 to go from the small blind. Salles called and the flop fell A 5 3 . Salles fired 100,000 and Levy made the call. The turn was the 10 and Salles bet 300,000. Levy released his hand and dropped to 945,000. Johnny Chan and pocket aces did not get along today. He lost a huge pot when he ran his kings into Robert Pisano’s aces during the first level and had a similar situation when he busted out. Chan open-shoved for 550,000 from the cutoff and Jonathan Driscoll snapped him off from the button. The blinds folded and the cards were turned over. Chan fell victim to the aces again and the board ran out 7 6 3 5 7 and Chan was eliminated. Duy Le raised to 40,000 preflop and Getty Mattingsley popped it to 105,000. Mizrachi made the call from the small blind and Le also tagged along. The flop fell 10 8 4 and everyone checked. The turn was the K and Mattingsley fired 176,000. Both opponents called and the river was the 5 . Le bet 500,000 this time and Mattigsley fled. Mizrachi decided to look him up after a session in the tank and Le tabled J 9 for a whole lot of nothing. Mizrachi showed 7 7 for just sevens, but it was good for the pot and he was at 3.9 million. 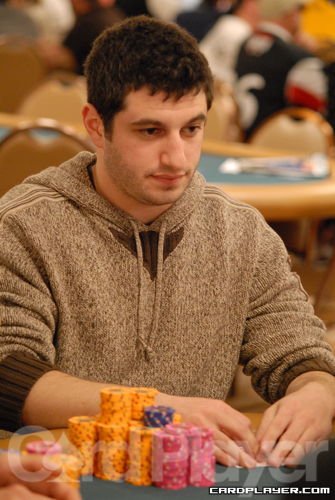 Patrick Eskandar raised from middle position to 135,000. Michiel Sijpkens called, Johnny Lodden called from the button, and Matthew Berkey came along from the big blind. The flop was 9 3 2 and Eskandar bet 200,000 after a check from Berkey. Sijpkens folded and Lodden raised to 590,000. Berkey folded and Eskandar moved all-in and had Lodden covered. Lodden let his hand go and kept his 2,950,000. He made a good decision since Eskandar showed the 9 9 , giving him top set. At the end of the last hour, David Benyamine was eliminated. He raised from the button and got into a preflop raising war with Pascal LeFrancois until all the money got into the middle. Benyamine was at risk for his last 1,400,000 with the Q 10 and LeFrancois held the A J . The dealer dealt out the 3 10 9 flop and Benyamine would need runners. The 9 on the turn left Benyamine drawing dead and he finished in 58th place. Jonathan Driscoll opened on the button to 145,000 and was met with a three-bet to 455,000 from Pascal LeFrancois from the small blind. After a fold from the big blind, Driscoll made it 1,025,000 to go and LeFrancois moved all-in for 4,725,000. Driscoll made the call. LeFrancois tabled Q Q and Driscoll showed J J . The dealer dealt out the board of 8 A 3 5 10 and Driscoll slipped to 1,700,000 and LeFrancois moved to 9,300,000 which puts him near the top of the chip counts. Action folded to Christopher Bolt on the button and he moved all-in for 785,000 and Josh Brikis made the call from the big blind. Brikis tabled K d10s and was slightly behind the A J of Bolt. The board ran out A 8 4 Q 9 and Brikis was down to just 45,000 in chips. He doubled up the next hand is up to 160,000 but was eliminated shortly thereafter. John Racener raised to 140,000 under-the-gun and William Thorson made the call, as well as Michael Mizrachi and Duy Le from the blinds. Mizrachi led out for 300,000 on a flop of K 10 9 . Le made the call and Racener folded before Thorson raised to 975,000. Mizrachi folded after two minutes in the tank and Le made the call. The 2 peeled off on the turn and Le checked over to Thorson who bet 2,000,000. Le was in a tough spot and thought for a few minutes before folding A Q face-up on the table. Thorson showed his 10 10 , giving him a set of tens to move to 9,500,000 in chips. Joseph Cheong raised in early position to 140,000 and Alexander Kostritsyn called in middle position before Gabe Costner called from the big blind. The flop came 9 6 7 and Costner checked over to Cheong, who bet 240,000. Kostritsyn and Costner made the call and the 10 came on the turn. Costner and Cheong both checked to Kostritsyn, who bet 825,000. Costner then put in a check-raise to 1,800,000. Cheong folded and Kostritsyn went into the tank for a while before eventually deciding to let it go and keep his 3,900,000 for another hand. Costner cracked the 10 million chip mark with the pot. It was a battle of the blinds and Peter Jetten somehow found all of his chips in the middle with the 9 5 against Dag Palovic, who had A Q . Palovic was actually all-in for 1,030,000, with Jetten covering him by 15,000. The flop was J Q Q and after the 4 fell on the turn, Jetten was drawing dead. He was eliminated on the next hand, but another player went out before him, earning an extra $30,000. Tony Dunst raised to 130,000 and was three-bet by William Thorson to 415,000. Michael Mizrachi made it 915,000 which got a quick fold from Dunst. Thorson quickly grabbed a stack of 100,000 denomination chips and slid them out into the middle and announced he was all-in. Mizrachi went deep into the tank for quite a while. Thorson eventually called the clock on Mizrachi. Mizrachi eventually elected to fold, but Thorson said he could pick a card to see. After Mizrachi picked one, Thorson revealed the Q and raked in a pot that would send him to 10,600,000 in chips. After a limp from William Thorson and Michael Mizrachi, Matt Affleck raised to 230,000. Thorson made the call and Mizrachi folded. It was checked to the river as the board came out J 9 10 10 8 and Thorson fired 210,000. Affleck made it 775,000 and after a while, Thorson let his hand go. Affleck chipped up to 7,800,000 after stacking his newly found chips. The fop came 7 6 2 , seemingly pretty harmless for Bolt. The 4 on the turn gave Statz a flush draw, however, which got there on the river with the 7 and Bolt was eliminated. On the last hand before the break, Bryn Kenney raised to 160,000 under-the-gun and Alexander Kostritsyn three-bet to 575,000 on the button. Kenney moved all-in and Kostritsyn quickly made the call. Kenney was in a world of hurt when he tabled his A Q and was up against Kostritsyn’s K K .
The flop brought some real drama as it came J 7 3 , giving Kenney a flush draw along with an overcard. The turn was a brick as the dealer dealt the 3 , but the 5 completed Kenney’s flush. After a count down of the chips, Kostritsyn was covered by Kenney and Kostritsyn was gone in 52nd place. Hasan Habib bet 155,000 from early position. Action was folded to Tony Dunst and he elected to move all in for 930,000. Action was folded to Habib and he called to put Dunst at risk. Habib exposed the A K and was flipping against the Q Q of Dunst. The flop was ugly for Dunst as it came K 5 4 . The 3 on the turn was no help to Dunst. However, the Q on the river gave Dunst the hand and the double up. He was at 2,030,000 while Habib fell to 985,000. Jason Senti shoved for 545,000 with the A 5 . David Assouline called with the 7 7 . The board ran out A 4 2 9 9 and Senti doubled up. He was up to 1,260,000 after the hand. Assouline was down to 2,095,000. David Assouline bet 125,000. Josh Brikis moved all in for 285,000 with the 7 7 . Assouline called with the A 4 . The board ran out K Q 9 7 5 and Brikis doubled up to about 800,000. Alexander Kostritsyn bet 150,000 from under the gun. Bryn Kenney raised to 400,000. Kostritsyn called and the flop came Q 9 9 . Kostritsyn checked. Kenney bet 520,000. Kostritsyn check-raised 1,500,000 more. Kenney folded. Kenney was at 3,300,000 after the hand while Kostritsyn was up to 5,160,000. One a flop of K 8 5 Cuong Nguyen bet 650,000. Joseph Cheong moved all in 2,620,000. Nguyen called. Cheong tabled the A K and was way ahead of the J J of his opponent. The 2 on the turn and 6 on the river were safe for Cheong. He doubled up to 7,850,000. Nguyen was down to 2,950,000 after the hand. Rudy Miller bet 175,000 from early position. Redmond Lee called from the small blind. Alexander Kostritsyn called from the big blind. The flop came J J 5 . It was checked around and the 2 fell on the turn. Lee checked. Kostritsyn bet 300,000. Miller called. Lee folded. The 7 landed on the river and Kostritsyn bet 225,000. Miller called. Kostritsyn exposed the 3 3 and was good. He was at 5,900,000 after the hand. Miller was at about 800,000 after the hand. Denis Pisarev bet 155,000. Duy Le raised to 350,000. Pisarev moved all in for 1,120,000. Le made the call and exposed the A K . Pisarev tabled the K K . Pisarev was in good shape to double up but the flop brought an ace for Le. The rest of the board failed to offer any help and he was gone. Le was up to 4,300,000 after the hand. Theo Jorgensen bet 135,000 from under the gun. Sergey Rybachenko moved all in for 925,000 in late position. 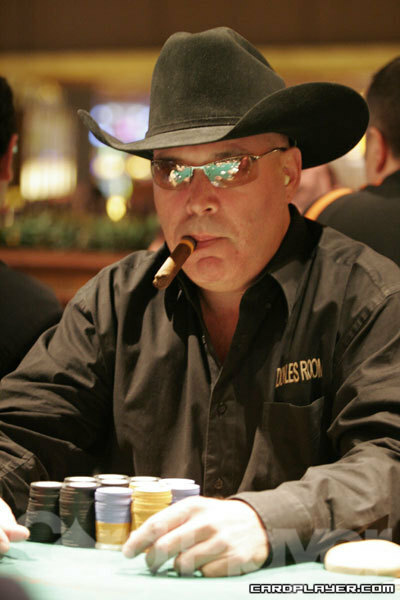 Eric Baldwin reraised all in from the big blind. Jorgensen folded. Baldwin tabled the 9 9 and was dominated by the K-K of Rybachenko. The board ran out 6 5 2 A 6 and Rybachenko doubled to 2,000,000. Baldwin was down to just 310,000 after the hand. He was eliminated a little bit later. Bill Melvin had all his chips in the middle preflop with the K K and was called by the A 9 of Scott Clements. The board ran out Q 8 7 4 A and Clements won the pot. He was at 3,300,000 after the hand. Corey Emery bet 140,000 from under the gun. Matt Harris raised to 350,000. Action was folded to John Racener. He four-bet to 785,000. Action was folded to Emery and he mucked. Harris moved all in for 2,020,000. Racener went into the tank before making the call to put Harris at risk of elimination. Racener tabled the A K and was in bad shape versus the K K of Harris. However, the board ran out Q 7 3 J A and Racener took the pot. He was the chip leader with 10,210,000 after the hand. Check out a CardPlayer TV video from earlier in the day! On a flop of 10 3 3 , Meenakshi Subramamaniam bet 175,000 into Scott Clements. Scott Clements made the call and they saw the 7 fall on the turn. Subramaniam checked and Clements bet 200,000. Subramaniam made it 500,000 to go and Clements didn’t go anywhere, as he tossed in the extra 300,000. The river was the the 7 and both players checked. Subramaniam showed K J and Clements showed A 8 , giving him the pot. Clements is up to 2,700,000 and Subramaniam fell just below 1,000,000. Alexander Kostritsyn raised from early position and Redmond Lee made the call from the big blind. The two saw a flop heads-up of 6 7 9 . Lee led out into the preflop raiser for 175,000. Kostritsyn made the call and the J fell on the turn. Lee moved all-in and Kostritsyn released his hand, slipping to 2,950,000, while Lee chipped up to 2,170,000. Richard Morgan raised under-the-gun and Habib Khanis three-bet all-in for his last 650,000. Eduardo Parras moved all-in for his 1,500,000 and Richard Morgan made the call, putting his own 1,300,000 stack into the middle. Parras had both players called as all three hands were turned face-up. The flop came 9 2 2 and Parras was still way in the lead. The 8 on the turn gave Khanis a load of outs. The 7 on the river notched the win for Parras and Khanis and Morgan were eliminated. 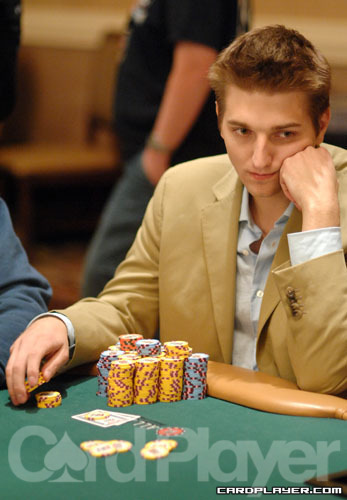 Michael Mizrachi fired 200,000 on a fop of 6 5 5 and Michiel Sijpkens made it 480,000 to go. Mizrachi made the call and the 8 came on the turn. Mizrachi checked and Sijpkens moved all-in for 1,375,000 and Mizrachi made the call. Mizrachi tabled 7 7 and needed to improve against the pocket queens of Sijpkens. The river was the J and Sijpkens doubled up to 4,000,000 and Mizrachi dropped to 6,300,000. Pierre Canali got all-in preflop against Adam Levy. Levy tabled K K and Canali showed A K . The board ran out Q 5 2 4 10 and Levy chipped up to 2,750,000 as Canali was sent to the rail. We caught up with this hand on the river with Ismail Erkenov leading out for 200,000 with the board reading 7 J 4 9 4 . Eric Baldwin raised to 650,000 and Erkenov went deep into the tank. After a while, Erkenov finally made the call and Baldwin pulled his chips back and tabled his hand as he showed J J , good for a full house and the pot. Baldwin climbs to 3,100,000 and Erkenov fell to 900,000. Duy Le raised to 120,000 from middle position and John Racner three-bet to 310,000. Le made the call and they saw a flop of 10 9 8 and Racener led out for 375,000 and was called by Le. The turn was the 7 and both players checked. The 4 fell on the river and that prompted Le to bet 425,000 and Racener made the call. Le showed 10 10 , but Racener showed 6 3 , giving him a straight and the pot. Racener moves to 8,500,000 and Le dropped to 3,950,000. Marcel moved his last 905,000 into the middle from under-the-gun with 8 8 and it folded around to Nicolas Babel on the button who made the call after some thought with A K .
The board ran out A 4 2 3 2 and Babel received the knockout and some chips to move him to 2,670,000, while Cole is on his way to the payout line. John Dolan rasied to 115,000 and Edward Ochana made the call. Peter Jetten then squeezed all-in for 780,000. Dolan made the call and Ochana got out of the way. Jetten tabled Q Q and Dolan needed to improve with his A J . The board came 2 9 9 8 6 and Jetten’s queens stayed in the lead and he doubled up to 1,700,000. Dolan fell to 1,400,000. On a flop of 9 7 3 , Eric Baldwin checked over to Theo Jorgensen who bet 375,000 and Baldwin made the call. The turn was the Q and both players checked and saw the 2 fall on the river. Baldwin now led out for 620,000 and Jorgensen made the call. Baldwin tabled 10 10 , but couldn’t top Jorgensen’s K K . Baldwin is at 1,670,000 and Jorgensen is now at 10,750,000. On the turn the board read 6 6 J 2 and Cuong Nguyen bet out 325,000. Meenakshi Subramaniam raised to 800,000. Nguyen called and the A filled out the board. Subramaniam moved all-in for 900,000 and Nguyen made the call. Subramaniam showed 8 8 and was eliminated when Nguyen showed the A 2 . Peter Jetten raised on the button to 125,000. Jacobo Fernandez three-bet to 475,000 from the big blind. Jetten moved all-in and Fernandez made the call. Fernandez showed J 10 and was racing against Jetten’s 5 5 . The flop came A J 10 and Jetten was going to need to hit his two outer to eliminated Fernandez. Jetten couldn’t find a five on the turn or the river and slipped to 900,000. Fernandez doubled up to 1,600,000. John Armbrust made it 125,000 under-the-gun and Redmond Lee moved all-in on the button. Armbrust made the call and was at risk of elimination. Armbrust showed A K and Lee held J J . The flop was 10 2 2 , keeping Lee in the lead until the dealer peeled A on the turn. Lee threw his head back in dismay but the J on the river saved Lee and eliminated Armbrust.